WEC Laser has become one of the largest laser profiling companies in the UK. Comprising of over 600 onsite staff working in our laser, fabrication and machining divisions, we're able to provide a friendly and efficient service whilst acting as a genuine one-stop-shop for our customers. 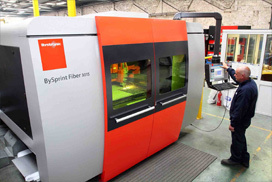 Continuous investment in the latest laser cutting technology is the key to the division's growth over the past two years. Our state-of-the-art CNC laser machines enable WEC Laser to compete at the highest level. Laser cutting is one of the most popular profiling technologies as it has the ability to accurately cut, melt, burn, or vaporise a range of materials, from Stainless Steel to Aluminium and Brass. Due to the accuracy of laser cutting, it's possible to cut small diameter holes with complex detail and good edge quality in either sheet, plate, tube or box section. Not only is it more precise than traditional cutting methods, but it also reduces manufacturing costs eliminating the need for machining on many engineering jobs. For more benefits, click here. For an overview on our full capacity, please visit our laser cutting capacity list. We also offer an unrivalled fabrication, sheet metalwork, machining and finishing service in-house. Thanks to recent investments in the latest dynamic waterjet cutting technology, we are now also able to water cut profiles of up to 200mm with any materials including alloys, acrylic, plastics, glass, and composites. A recent partnership deal with Rotherham based MTL Group has more than doubled our manufacturing capacity and means we can now offer large profiling with bevel cutting facility, Hi-Def plasma cutting and large tube cutting. The capacity at 5750 Components, WEC Laser's sister company in Liverpool, has also benefited from recent investments, having moved from 2 to 3 flat beds and a new single-head laser. This has led to an increase in capacity and the move from a two shift system to three, enabling us to respond quickly to all our customers' laser cutting needs.